Precious metals futures were mostly lower Tuesday following an extended break from trading for the U.S. Memorial Day holiday. Gold and silver registered their second straight session loss as the U.S. dollar gained against other world currencies. Gold for June delivery declined $4.70, or 0.4%, to settle at $1,299 an ounce on the Comex division of the New York Mercantile Exchange. "Although risk aversion has the ability to support gold in the short term, an appreciating dollar and expectations of higher U.S. interest rates are likely to continue weighing heavily on the yellow metal in the medium to longer term," MarketWatch quoted Lukman Otunuga, research analyst at FXTM. 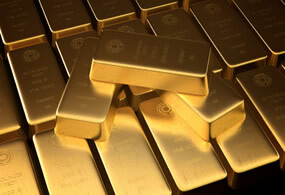 Gold futures ranged from a low of $1,291.40 to a high of $1,306.10. They advanced 1% last week. On Thursday, gold ended at an almost two week high at $1,304.40 an ounce. Silver for July delivery fell 17.3 cents, or 1.1%, to end at $16.373 an ounce. Silver futures traded between $16.31 and $16.53. Last week, they rose 0.6%. July platinum added $4.60, or 0.5%, to $905.90 an ounce, ranging from $899.90 to $910.50. Palladium for September delivery — the new, most active contract, lost $4.70, or 0.5%, to $971 an ounce, trading between $969.30 and $983.40. The pair of metals each rose 1.7% last week. Last week in LBMA results, prices for palladium shed 0.3% but those for gold, silver and platinum advanced by 1.2%, 1.7% and 2.7%. United States Mint bullion sales were unchanged Tuesday. Last week, sales of the Mint’s gold coins at 16,500 ounces were the highest since the week ended Jan. 12 when the newly 2018-dated issues launched.